ECOS Environmental Consultants works with entrepreneurs, SME and multi-national businesses to achieve their specific needs relating to Water, Waste and Wastewater. Their tagline is ‘Control Cost Treatment Licences R&D’. ECOS was founded in 2011 by Mark McConnell. A Chartered Water and Environmental Manager, Mark has worked in the environmental sales and consultancy sector and specialised in wastewater treatment since 1991. Blink Design™ began working with Mark on his new brand identity in the summer of 2013. Following the design brief aspect of our process and having met with Mark, we developed a variety of concepts for the new brand identity. Representing water, we agreed that the colour blue would be important and so we used that as our colour base. We brain stormed and experimented with different ways of visualising ‘ECOS’ and ‘Environmental Consultants’. The tagline itself also changed during the process, as is often the case when you are working through the brand strategy and testing how your message is communicated. .
Alongside the concepts, we also experimented with font styles. We wanted a very clean-style font. Having worked through initial concepts, we agreed on the design and we tweaked it further to finalise it (as you see here). We liked the idea of the different blue shapes depicting water in an abstract style and creating transparent blue layers within. They also create a natural forward movement, which is very symbolic for the business. The identity was designed so it could easily adapt to different situations. It works with and without the tagline and also in portrait and landscape layout. Once we completed the brand identity we also designed the business cards and letterhead. We designed soft copies in M.S. Word format for convenience. Further to this project, we designed the new ECOS website. Check out www.ecos.ie to learn about Mark’s business and click here to read about the website design process. We initially engaged Louise and her team at Blink Design in 2013 to design our logo and improve how we present our corporate identity. We were impressed with the attention to detail and great care which Blink Design took to understand what ECOS do as a business, our standards and the value which we present to our Clients. 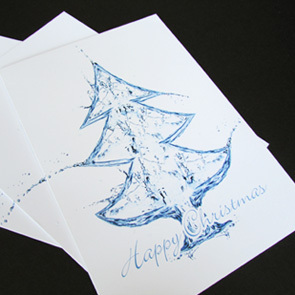 So impressed were we with how Blink Design demonstrated their flexibility whilst maintaining the highest standard of work (on time and within budget) that we have repeatedly engaged them on a number of projects including the design of our website, production of our corporate Christmas cards and stationary. ECOS now view Blink Design as our trusted graphic design partner whom we look forward to working with on future projects. Knowing that Blink Design will provide superlative work from concept to final delivery and their consistent professional approach to what they do are just some of the many reasons why ECOS are pleased to recommend Blink Design to our clients and project partners.